Join Jessie as she talks about the roots of spoken word poetry and encourages you to speak your truth onstage. 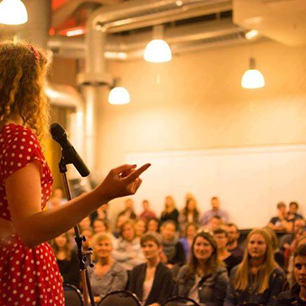 Jessie’s talk will cover topics like finding your stories, how to craft an engaging poem, performance tips, slam poetry strategy, and the talk will close with an open mic, where you’ll have a chance to get up and share your own poetry. Suitable for anyone with a story somewhere in their soul.